Trend of online shopping n Pakistan has eventually evolved in the past few years. Now many Pakistanis, who have access to internet, are used to online shopping or at least have shopped once online. There are many reasons to shop online; some of these are easy to search your desired product, no hassle of wandering from shops to shops etc. But the main attraction of online stores is the competitive prices and the discounts they offer. So here I will enlist some tips for you to get more and more discounts from online stores. Online stores usually offer discount codes to the persons who have created accounts with them. 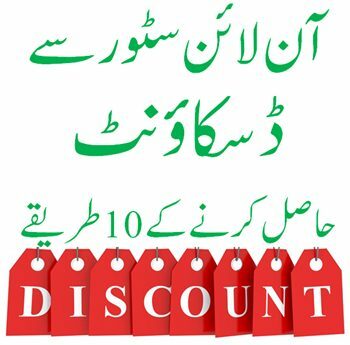 So create accounts with major online stores and you will get discount codes through SMS or email. You can use these codes at checkout to avail discounts. Many online stores requires to get people install their mobile apps and they offers huge discounts on initial install of mobile app. Sometimes their might be price difference of same product on website and mobile app. Secondly mobile may also show discounts for its users as app notification. Add products to your shopping cart but do not check out immediately. If you aren't in a rush to get something immediately, put it in your shopping cart and leave it for a day or two. Vendors want to close the deal, so they’ll find ways to draw you back. You might get a discount coupon or an offer for a better price sent to your email trying to attract you back and complete your shopping. A lot of stores are apparently used this system, so it's worth a shot! In west, concept of discount coupons is very popular among online customers. Some websites are dedicated to offer discount coupons (which is mutually agreed between the shop and coupon website) for other online websites. 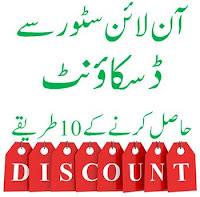 The very same concept has been started in Pakistan in the form of few coupon websites. You can try searching discount coupon on these websites. Although it is not direct way to get discount but indirect. You should check other websites to get the rates they offer for the same item. Sometimes there may be big difference in the prices which leaves no place to get this item from the retailer which offers best rates. There are also some websites which compare prices of different online retailers. Apparently it looks like creating accounts but it has its own value. Online shops often send coupons to those on their email list. Also, many stores offer you a coupon for up to 10% off just for joining their mailing list. Many stores give discounts on purchase of certain minimum amount. So you can get fixed or percentage discount or free delivery, if you buy above minimum amount. In this case wisely select other products just to get discount offers. Alternately, you can ask any of your friend to purchase jointly to meet this limit. It is also very popular way to get discounts. In this way, you will have to pay via recommended payment method to get special discounts. Sometimes websites offer discounts if you pay via their recommended payment partner e.g. Credit Card, Debt Card, Easy Paisa, Jaz Cash etc. It's simple, just keep visiting daily deals or sales page of your online retailers and you will get products at much lesser rate. People usually don't try this but if you think you are a good bargainer, you can try your luck by calling on their phone and ask for discount or free delivery. And you may also get some discount in this way.